Hey, internet, what are we searching for? NOW, here’s the important stuff. This is a case of “Hey internet, what are we searching for?” where a person gets it RIGHT. Do you take lunch? Hell no. You go to the internet cafe on your break and do it right. Step one you go to a .edu site. Find some scholarly materials on the Plastic Bags vs. 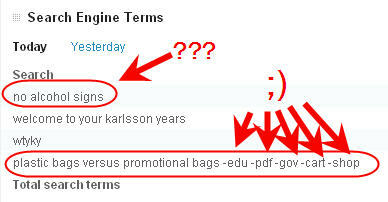 Promotional Bags debate and find out what the academic temperature is on this thing. Go to the government site over this and find out what the latest policy is on the subject just to cover all bases legally speaking. FINALLY, you put your choice your cart and press SHOP and BOOM here you are on Welcome To Your Karlsson Years (obviously). This entry was posted in what are we searching for? and tagged drunken rage, internet kingdom, whimsical journey by worsteverything. Bookmark the permalink.